Equipment servicing: are you using the right scheduling method? Scheduled servicing contributes significantly to a site’s costs, downtime and maintenance labour requirements. Typically categorised into A, B and C classes, scheduled servicing generally occurs at 250, 500, 750 or 1000-hour intervals for mobile equipment. 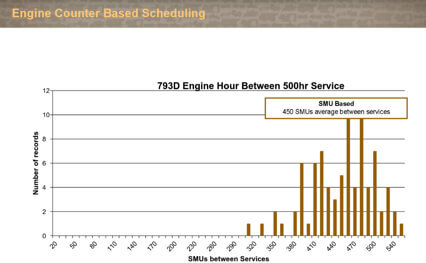 The focus of scheduled services is often on increasing the lifespan of major engine components. However, due to the frequency and expense of these activities, downtime and labour can end up costing more than the engine. To simplify maintenance scheduling, services can be switched to occur on a calendar rotation. For example, a 500-hour service could be scheduled to occur monthly. This allows a simpler scheduling regime compared to maintenance of a machine based on hours, as well as a more effective use of workshop space and maintenance labour. 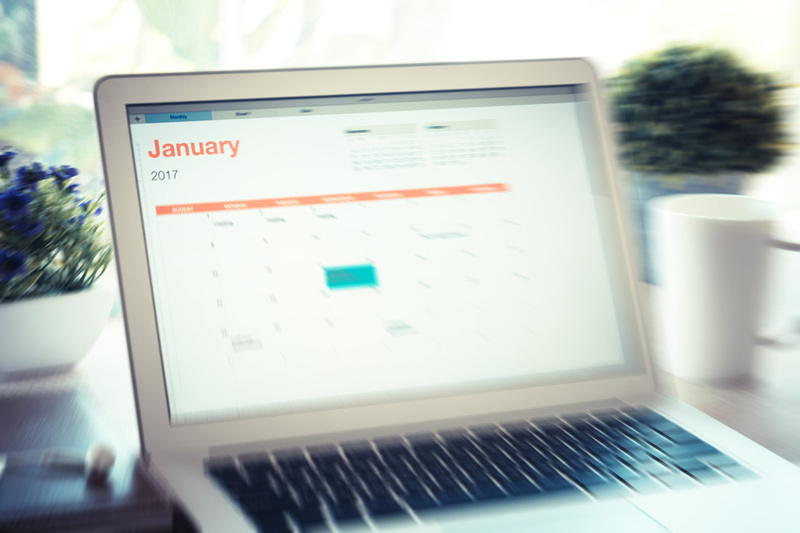 However, calendar-based scheduling can come at a high cost – one that is often not truly appreciated. A mine that runs its scheduled servicing based on machine hours has its maintenance team wait until the asset accrues enough hours to be ‘in the window’ to then execute a service. 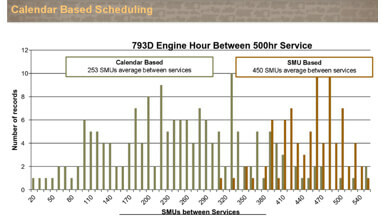 Shown below is a distribution of the engine hours between scheduled services for a mine running 793D trucks. There is variance, but most services are conducted between 400 and 500 hours, with the average being 450. Emeco conducted a review of the mine after changing its scheduling regime to services based on a calendar drumbeat. It was a great opportunity to see the same team, with the same assets, using a different maintenance approach. The below graph shows what happened. The variation of hours between services spread out considerably, with the average time between services dropping to 253 hours; effectively doubling the serving levels on the assets. It is worth noting however, that some assets in the fleet remained at a service interval of 500 – 540 hours. The distribution is spread because the actual utilisation varies significantly through the fleet. Actual usage depends on many things, and any given calendar-based schedule chosen would result in the same. It is not a practical option to extend the time between services, as it would mean high-utilisation assets would have a much higher time between service, putting the asset at risk. Moving to calendar-based scheduled services can simplify labour management, improve workshop space and increase work management metrics like schedule compliance. However, there is a high price to pay for that simplicity – which in this case was more than 1,344 direct labour hours per annum. This isn’t unusual, and is typically the case for trucks and ancillary equipment. However, for assets that don’t have a high variance in monthly usage, the calendar system can work well. For example, front line excavators often have a consistently high utilisation, which makes calendar-based servicing more efficient. Many sites become complacent about the issue of scheduled servicing, and accept the costs as part of doing business. At Emeco, it’s our mission to add value for clients by fostering continuous improvement on equipment and service solutions. We make smart asset management decisions to maintain equipment availability and reliability in the most efficient way. For maximum efficiency and profitability, it is worth considering your site’s equipment usage (by the hour) and servicing frequency. This will help you identify the best method for minimising costs while maintaining the health and lifespan of site equipment. Emeco, which provides safe, reliable and maintained equipment to the global mining industry, has challenged this standard practice to find a more efficient method. Hire truck value of $350/hour = $470,000 hire cost per annum.